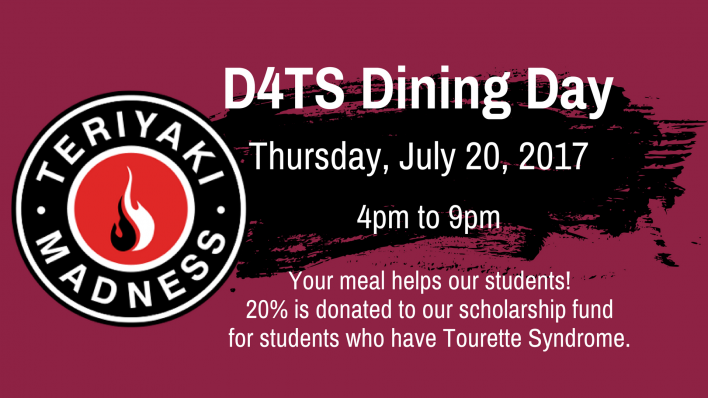 BOCA RATON, FL – The Kelsey B. Diamantis TS Scholarship Family Foundation, Inc., dba Dollars 4 Tic Scholars, a local non-profit organization that awards scholarships to students with Tourette Syndrome, invites the public to participate in its “D4TS Dining Days” Summer Fundraiser on Thursday, July 20, 2017 from 4pm to 9pm at Teriyaki Madness, Mission Bay Plaza, 20437 State Rd 7, Boca Raton, FL 33498. Teriyaki Madness has generously offered to donate a percentage of each dining purchase to Dollars 4 Tic Scholar’s Scholarship program. A printed flyer or phone image must be presented at the restaurant to participate, and is available by visiting www.dollars4ticscholars.org/teriyaki online. For further information, please contact Dollars 4 Tic Scholars at 561-487-9526, or by email at info@dollars4ticscholars.org.